The La Jolla Music Society‘s Summerfest is underway with another exciting season of chamber music and world class performers, this year with a theme of pianos and strings. Saturday night brought a perfect example of the beauty and soulfulness of La Jolla’s annual music festival, featuring leading musicians from around the world. First there was the amazingly brilliant pianist Olga Kern delighting with three prelude pieces by Rachmaninoff, two studies by Scriabin and Mily Balakirev’s “Islamey.” All six pieces, very difficult, were performed from memory by Kern. Then the pianist joined the dynamic soprano, Lybubov Petrova in “Gypsy Songs” from Dvorak. After a short intermission the evening’s additional highlight was a piano quintet by Dvorak presented by the Miro Quartet and accompanying pianist Inon Barnatan. Tickets are still available for the remaining 14 events in the festival at the website of the la jolla music society at www.ljms.org. Of particular interest are forthcoming violin sonatas by Beethoven, presented over three nights as well as in a free afternoon program. The first of these four Beethoven sonata concerts, on Tuesday, Aug. 15, will feature festival director Cho-Liang “Jimmy” Ling, the Rice University professor whose violin mastery is always loved by Summerfest audiences. A concert goer on Saturday night would have been dazzled by the piano artistry of the glamorous Kern and the beautiful identical Naughton twins. There were repeated gasps in the audience as these women, joined in one number by world class soprano Petrova, came to the stage at the Conrad Prebys Concert Hall at UC San Diego. The sheer beauty of these performers was soon overtaken by appreciation of their fingers, hands and voice. Then, in a dramatic aesthetic change, in the second half of the Saturday program, came the Miro Quartet accompanied at the piano by the spectacular Barnaton. The quartet has been together since 1995 and their 38-minute rendition of Dvork’s piano quintet in a major was chamber music at its finest. Part of the drama for the audience was seeing these five compelling men honoring Dvorak, after seeing the beautiful women, also with highest skills, in the concert’s first half. Festival director Ling, seated in the audience could hardly contain his joy and appreciation at his own creation, having brought these colorful and deeply skilled performers to Summerfest. The Dvork quintet showed off the work of the then 46-year-old composer, who in 1887 wrote this work featuring not only the tradition of classical Viennese forms (Dvork was a friend and admirer of Brahms, for example) but also employing the passion of his Czech nationalism. The result of this performance brought the Summerfest audience to their feet, for a well-deserved standing ovation. Along with the concertizing, Summerfest offers many free encounters and rehearsals. Substantially enhancing each concert are free ticket-holder “preludes,” mostly talks presented by the irreplaceable Eric Bromberger, who writes the Summerfest program notes. Saturday evening, Bromberger interviewed the Naughton twins, which proved to be an evening highlight. (One could learn, for example, that the twins were born in Princeton, NJ, with Chinese and European parents, but their amazing synergism was also on display in this prelude talk.) If at all possible, these pre-concert prelude events should not be missed by patrons. This was an evening of amazing hands, passion, beauty and soulfulness. 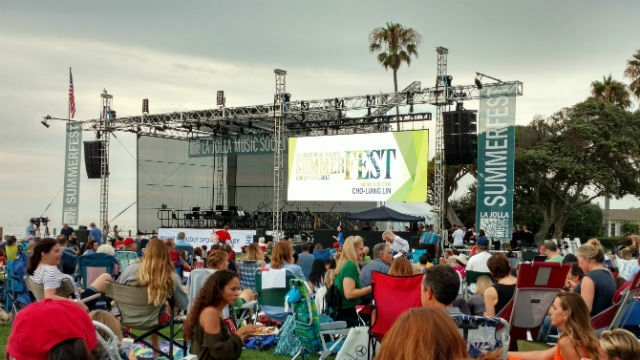 Asked where is the soul, a reviewer of Summerfest performances had a ready answer: “The soul is where love and joy reside,” filling one with appreciation of what can be found this summer in La Jolla.